Errol: It’s friday! Huzzah! And what are your friday plans tonight? Me? I have an interview with Geek Hard for the geek band! I’m crazy excited to be on podcasts! This entry was posted in 2013 and tagged dave, val. Bookmark the permalink. 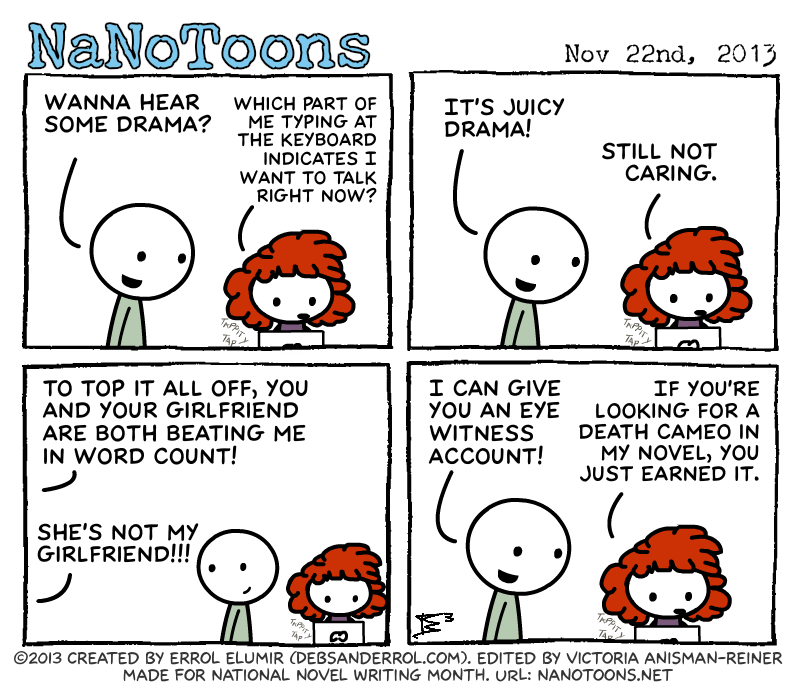 I have to say, you guys, the cartoons, and the videos are one of the best parts of nano. Thanks for getting me to the computer every day. Awwwww… thanks so much! ^_^ I’m glad you like them! Oooh Death Cameo! I like it! LOL Love Victoria’s answer…. so gonna have to remember that one! I am thinking of printing this out and affixing it to my laptop. Why couldn’t this be in an early of the month comic so I could have had it all nano? *laugh* You can save it for next year! *laugh* That is awesome! 😀 Huzzah!